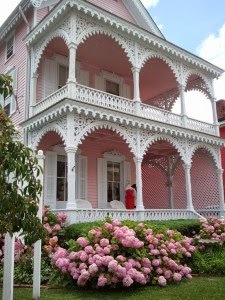 to shore towns whose streets are lined with old-fashioned “gingerbread” Victorian homes (Cape May). 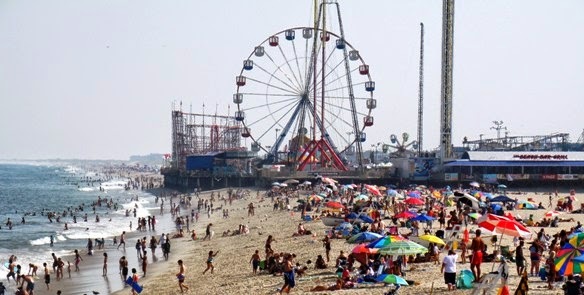 But no matter where you go along the Jersey shore, you’ll find great local seafood (OK, so the shrimp aren’t caught here) – perfect for a summer clambake. 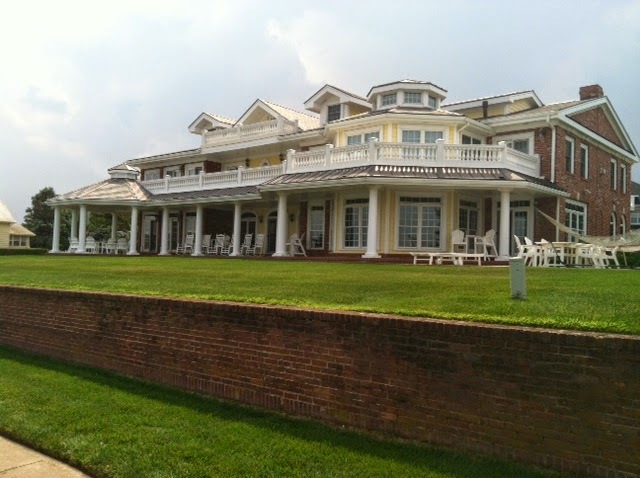 We were lucky enough to be invited to one such event at the lovely seaside home of friends – Mary Ellen and Jim – in Pt. Pleasant. 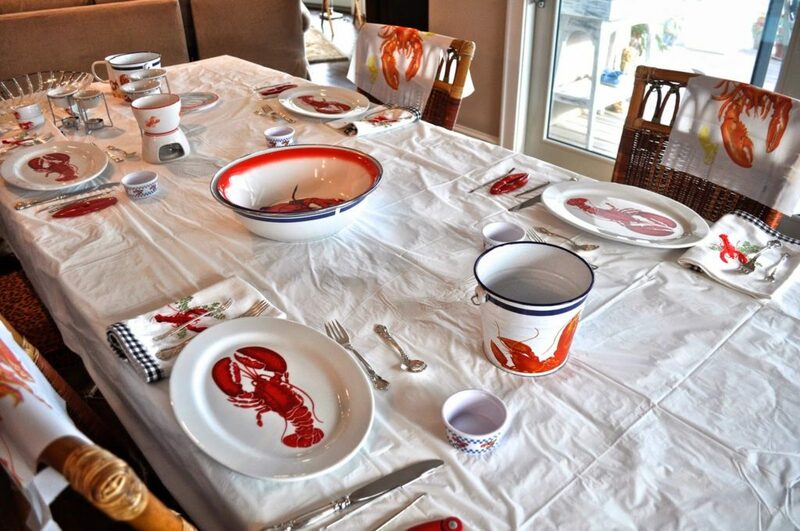 The lobster-themed table setting was a hint at the feast to come. 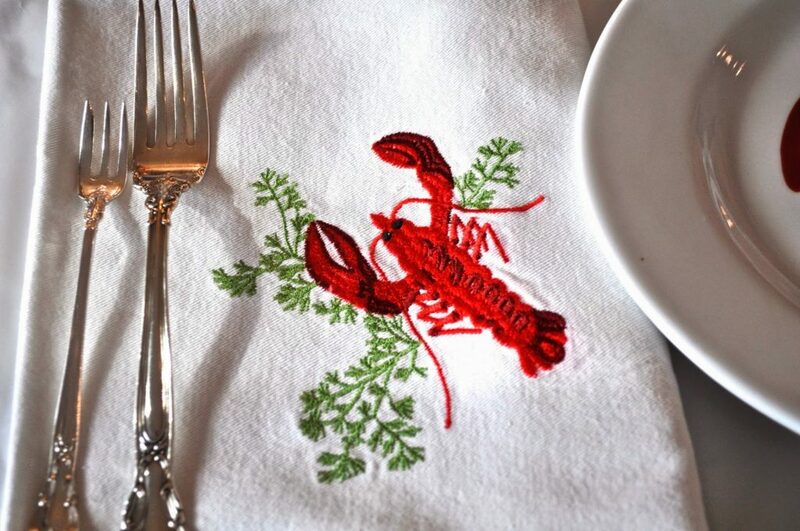 Take a closer look at the beautiful, embroidered napkins. 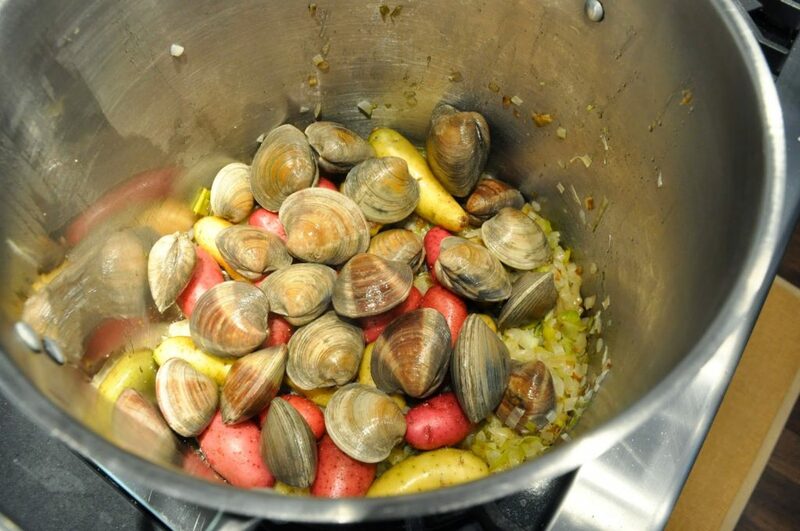 We arrived in time to see the whole process, which starts with an assortment of seafood and small potatoes. The recipe, from Ina Garten, also calls for kielbasa. Mary Ellen left it out and I was glad she did, because I’m not fond of the smoky taste of the sausage either. Throw in corn in you like, but you really don’t need it. 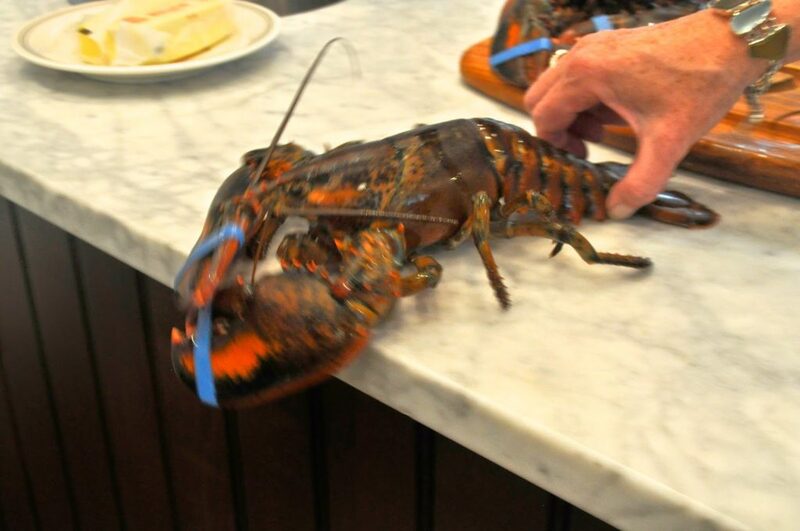 Don’t forget the lobsters — quick, before they get away. The recipe starts out with a sauté of leeks and onions in good olive oil. Make sure you’ve got a huge pot to contain all the layers. First the potatoes, then the clams. 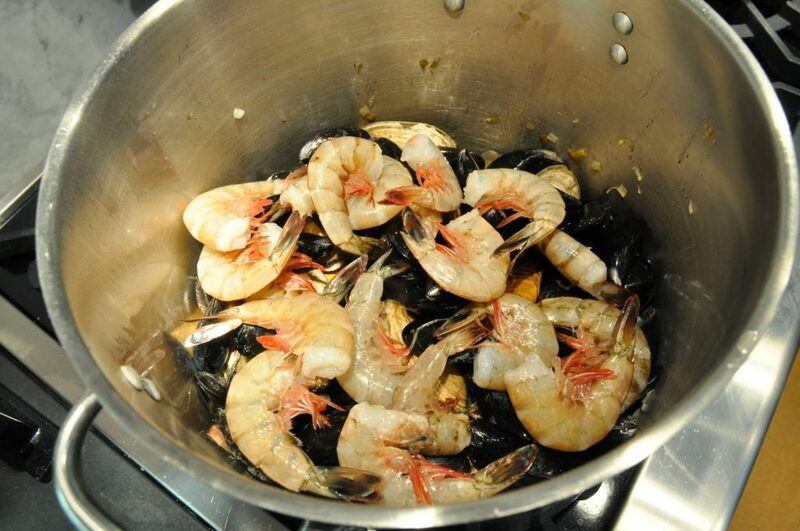 Pile on the mussels and shrimp next. 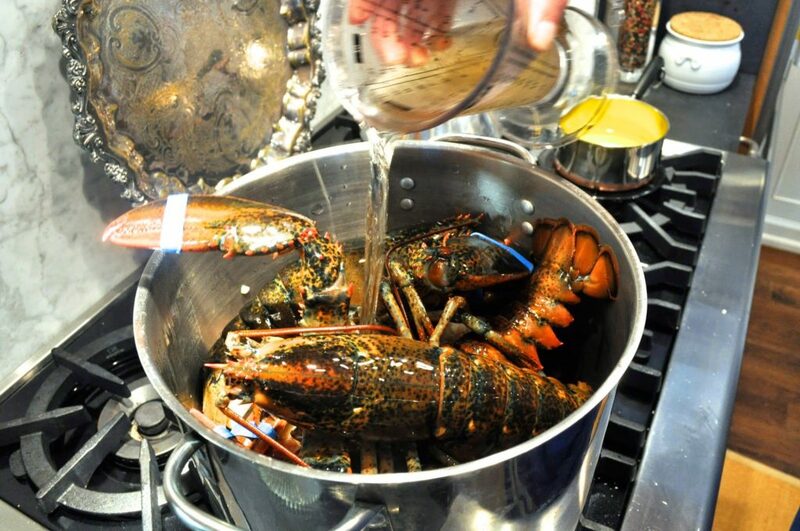 Finish with the lobsters, pour in some dry white wine and place a lid on top (maybe with a weight as well, to keep those frisky crustaceons from clawing their way out). 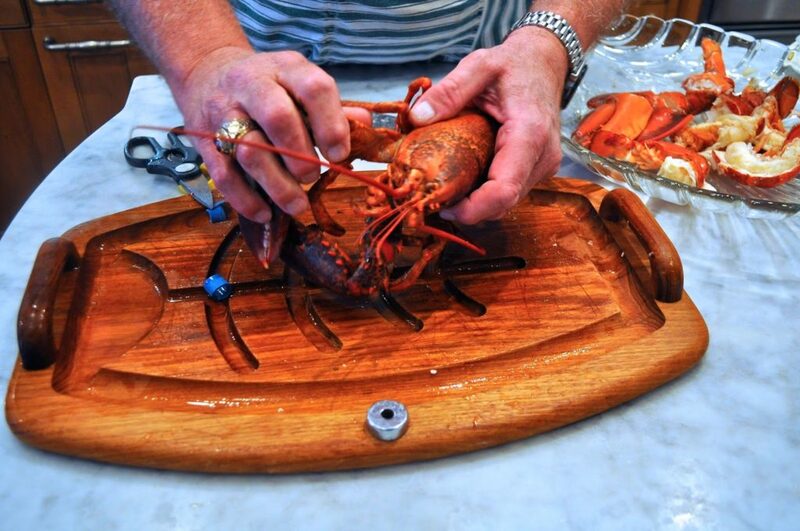 You could tell he’d done this many times before, expertly slicing the tails in half before placing them on the platters with the rest of the seafood and potatoes. There were four of us at the table, but more than enough food for at least two more. This is only one of the platters. No complaints here, as we dug in with gusto. 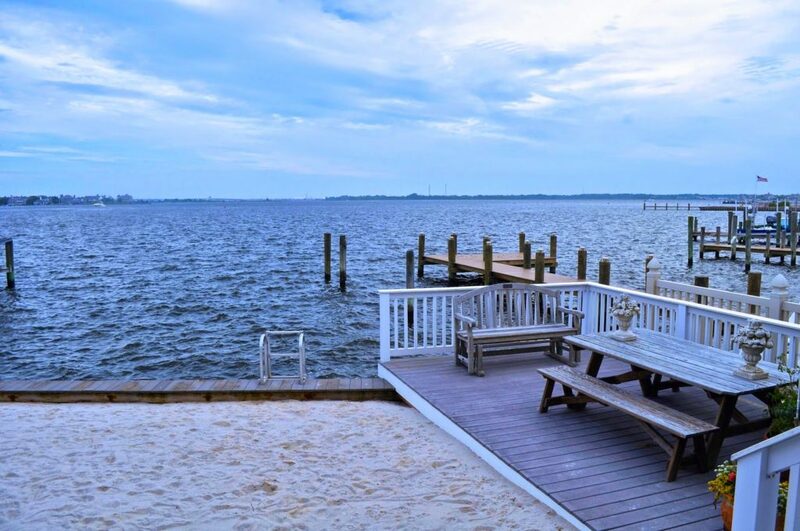 This mesmerizing view of the bay (their “back yard”) only added to the enjoyment of the meal. I think I could happily eat hot dogs and beans with a view like this, but I sure was glad to be eating the clambake instead. Thanks Mary Ellen and Jim, for a fun night of terrific food and friendship. Magnficent! I'd love to taste this clambake. Such a fun way to eat, love it. Great food, beautiful view and sharing with good friends, nothing better! All my favorite foods! I could eat lobster every day if I was able! 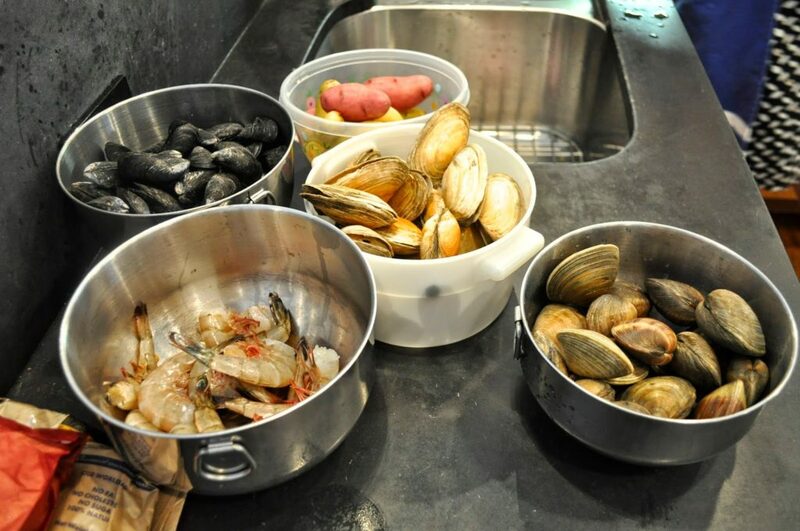 We just came back from a family vacation at the Outer Banks, NC, and one of our memorable meals there was a seafood steamer pot meal we cooked together that had clams, mussels, scallops, shrimps, crab legs. 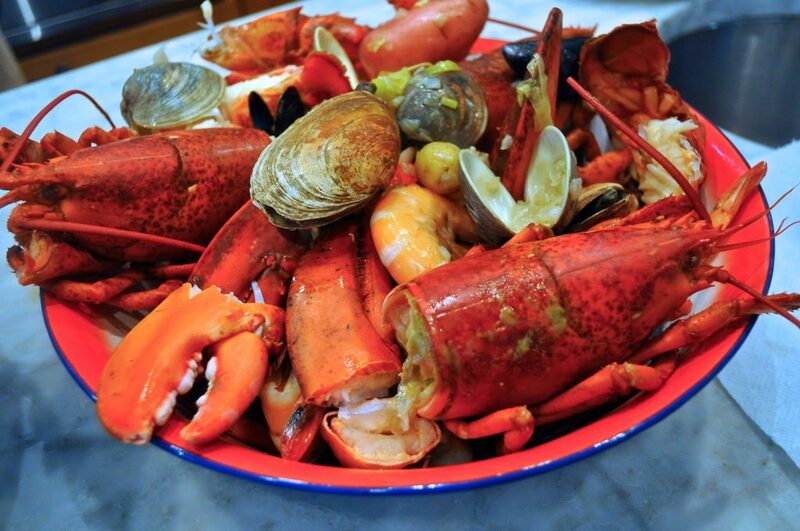 lobster,corn and red potatoes. It was a delicious feast! What a lovely invitation to 'the shore' 🙂 I love every component of that clam bake. 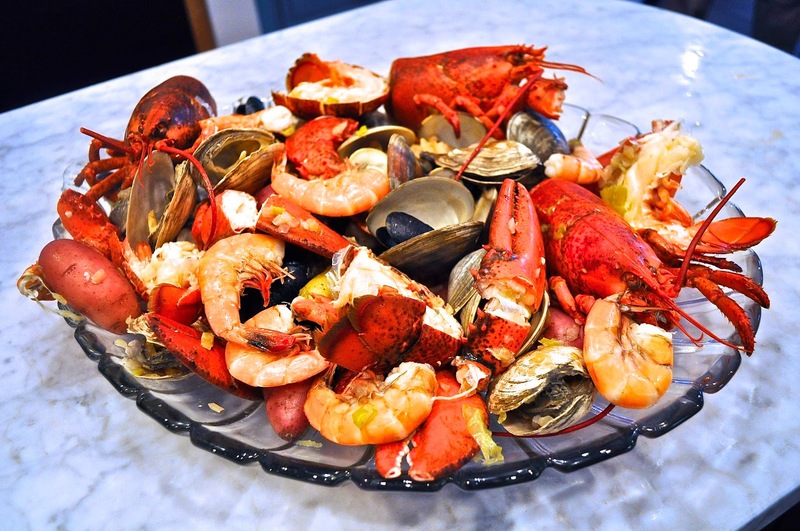 Our next gourmet, hosting by friends, will be a lobster boil which is very similar except done in a huge pot over a fire outdoors. Delicious! 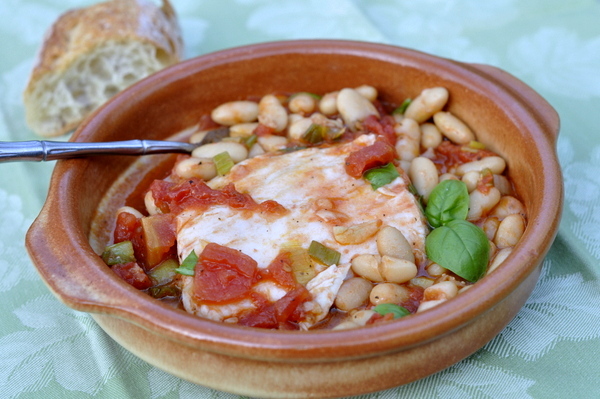 Un piatto favoloso, voglio provare anch'io questa ricetta. un abbraccio Daniela. Oh, would I love to be invited to a dinner like that. We don't do anything like that on the West Coast. Lobster is a rare treat here. Looks like a fun evening. Love Cape May! Used to go there "back in the day." Such a beautiful town. 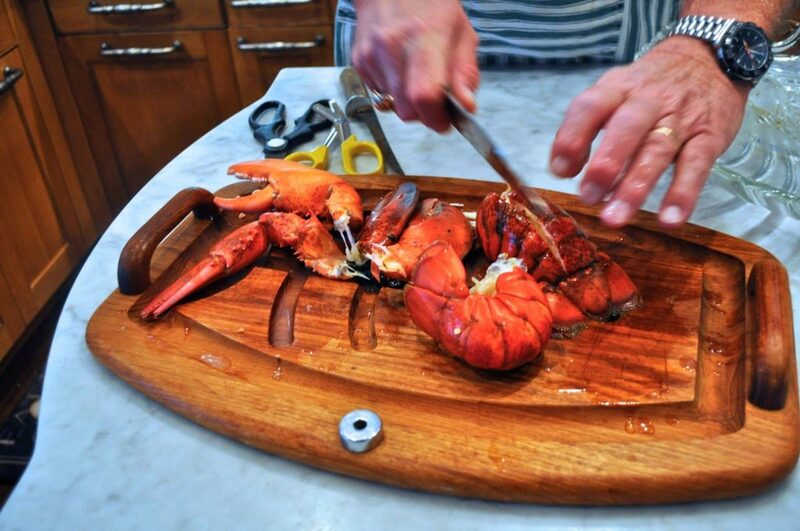 Also loving the clambake and must do this at least once – but sans lobster. Buying fresh lobster in MN is a car payment! What a summer-delicious post. This is something I need to read in January! A reminder that winter gives way to such sweetness. What a location and what a wonderful food experience . 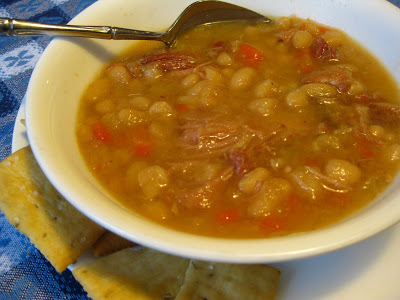 . . reminds of the "Lowcountry Boils" here in SC. Have a great weekend, Linda.